Each client who graduates from our Learn & Earn Program receives a diaper bag along with other baby items. Please help us to bless them as they begin their journey into parenthood! These are the current items needed for our Baby Baskets. 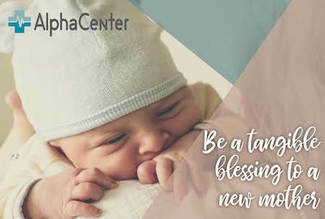 To drop off your donation, please bring it to Alpha Center during our business hours, M-Th 9:30AM-5:30PM. Parking is in the back of the building and you can come in through the front door.